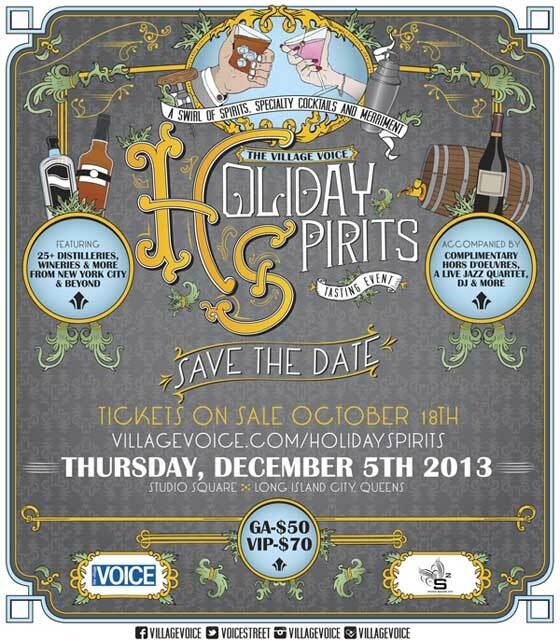 Tickets are now on sale for Village Voice’s newest Holiday Spirits tasting event to be held on Thursday, December 5th, 2013 at Studio Square in Long Island City, Queens. The event will run from 7:30pm to 10:30pm with a VIP-only preview hour at 6:30pm. Guests will be have assess to unlimited samplings from over 25 distilleries, wineries, complimentary hors d’oeuvres, a souvenir glass, an exclusive Brooklyn Pour photo booth, and entertainment throughout the night. The Empire Suite room on the 6th floor will feature a live jazz band, The Blue Vipers of Brooklyn, and The Gallery room on the 5th Floor will feature music with DJ Tim Martell. Studio Square is an official partner of 2013 The Village Voice’s Holiday Spirits Tasting Event. General admission tickets are $50. VIP tickets are $70. In addition to early admission, VIP guests will also receive a commemorative VIP wine gift bag.